This project is for the birds. Really is. Top, the osprey checks the nest platform at Sandpoint’s Memorial Field; below, mother goose on her eggs in the eagle nest at Kootenai National Wildlife Refuge. 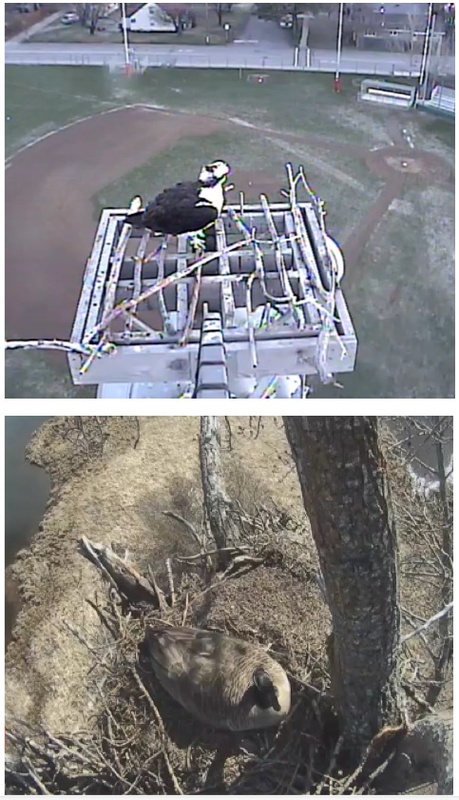 One of the “most fun” projects we have carried out with our own publications the last couple years has been the osprey and eagle cams we stream live onto our community portal website, SandpointOnline.com. Two years ago in partnership with the City of Sandpoint, Avista and Northland Communications we placed a web cam on an osprey nest at the Sandpoint Memorial Field; it proved immensely popular as people were able to watch the ospreys build their nest, lay two eggs and successfully hatch and rear one chick. Last year, however, the cam produced a surprise, as geese took over the nest and prevented the osprey from using it. The geese provided an interesting show of their own, including a dramatic scene when the baby goslings hatched and then had to leap down from the 100-foot-tall nest. Meantime, also last year we worked with the Friends of Kootenai National Wildlife Refuge to stream a cam they had placed on an eagle nest at the refuge, but again with an unexpected result; the eagles laid two eggs but neither hatched.